Since their inception in 1981 Culture Club have sold more than 50 million records worldwide, lead by their classic hits, “Do You Really Want to Hurt Me,” “Karma Chameleon,” and “I’ll Tumble 4 Ya.”The group is fronted by British singer/songwriter Boy George, who is universally recognized as one of music’s iconic artists. George was recently presented with the Ivor Novello lifetime achievement award in 2015 for his contribution to the music industry. 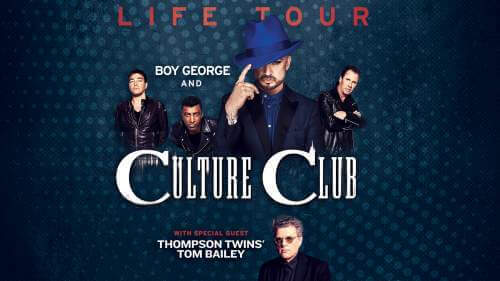 Roy Hay, Mikey Craig and Jon Moss make up the remaining original line up set to tour.Culture Club will be accompanied by the Thompson Twins’ Tom Bailey. With a new all-female band, Tom Bailey will be performing the Thompson Twins’ hits. The Thompson Twins had huge hits on both sides of the Atlantic. Songs such as “Hold Me Now,” “Doctor Doctor,” “You Take Me Up” and “Love On Your Side” provided the soundtrack for so many people’s lives worldwide in the mid-eighties.Relive the era with the hair was big, the shoulder pads were bigger, and these bands were releasing some of the biggest pop singles of the day.